A Stampin' Up! UK demonstrator blog by Amanda Bates in North Yorkshire ... Daily Tutorials, Tips & Sharing of creations of cards, boxes, bags, mini books & scrapbooking. Shop Online. Lots Of Stampin' - A blog which is really a diary of sorts. It consists of the stamping and paper art I am doing and challenges I am entering. Some step-by-step techniques are included. Future plans include video tutorials.Comments are always welcome! 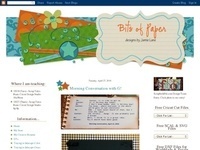 Crimson Cloud Blog - Blog for all card makers, scrapbookers and papercrafters.Full of ideas, inspiration, techniques and news. Updated at least once a week - make sure you check back regularly.